Recently, the Commission on Higher Education (CHED) has ordered the closure of some degree programs offered in two higher education institutions (HEIs). A week ago CHED reported having ordered the closure of two programs of the Philippine Maritime Institute (PMI) for continuous non-compliance with quality standards set by the CHED. These programs were: BS Marine Transportation and BS Marine Engineering, both offered by the Manila and Quezon City campuses of PMI. The closure order means effective the first semester (2012-2013) PMI cannot offer these programs anymore. Students enrolled in these two programs will have to transfer to other institutions offering said programs. The other day, CHED ordered the closure of six more programs, all offered by the Harvardian College in San Fernando City in Pampanga. The programs ordered closed were: BS in Education; BS in Elementary Education; BA Political Science; BA English; BS Commerce, Accounting, Management, and Finance; and Master of Education-Administration, Supervision, Guidance and Counseling. According to CHED, these programs were ordered closed due to “gross and serious violations and continuous defiance of the Commission’s policies, standards and guidelines.” The closure order, according to the CHED, was served on 25 October 2011. Like the programs of the PMI, these six degree programs must be discontinued beginning the first semester of the coming school year. This is a laudable effort of the CHED, to maintain the standards of quality that could make degree programs offered anywhere in the Philippines competitive worldwide. This is long time in coming. If the CHED looks closer, however, there are still very many programs out there that should be ordered closed. Many of these programs are being offered without permit from the CHED. They are illegal programs, and yet the HEIs offering them are raking in money without offering in return quality educational services. We’ve known this long, long time ago, but our government has, until now, refused to listen. Therefore, I find it comforting to see that CHED may mean business, finally. The students of PMI have been reported to be complaining about the closure order for the two degree programs offered by PMI, claiming that they’d be forced to transfer to institutions charging higher fees. This is unfortunate, indeed. However, logic tells us that spending a little more for one’s education and training and getting in return the right quality of skills required by the highly competitive market is better than graduating from a substandard program and later found unqualified for job open to other graduates from other countries. Clearly, the intention of CHED is to improve the global competitiveness of our graduates from our HEIs. Now, there are almost 2,000 HEIs in the Philippines. Of these, less than 200 are state universities and colleges or institutions supervised by CHED. Hence, the greater bulk of HEIs in the country are private institutions. I can hazard a guess that at least half of these institutions are substandard HEIs, offering degree programs for which they do not have enough qualified faculty to teach. And they charge exhorbitant fees on top of these shortcomings. Top that with the fact that these institutions complain the loudest when it comes to implementing rules and regulations designed to greatly improve educational standards in this country. A couple of weeks ago, this floating resto-park called Isdaan opened for business. It’s located along the Bay-to-Pila bypass road within the boundaries of Calauan. On the same stretch of the national road are similar eating places: Kainan sa Palaisdaan and Samaral. Lucidel, the first such kind of resto opened way ahead of the others. Isdaan, however, is the largest and most spectacular. It’s a theme park of sorts, a branch of what has become a popular resto-park in Gerona, Tarlac. The resto-park isn’t complete yet, but when it’s finished many children would enjoy running around the place, including a free boat ride around the 4-ha. facility. Life size statues, like those in Gerona, are present but the difference is that in the facility in Calauan there are new personalities like Obama, crocs, and the Angry Birds. 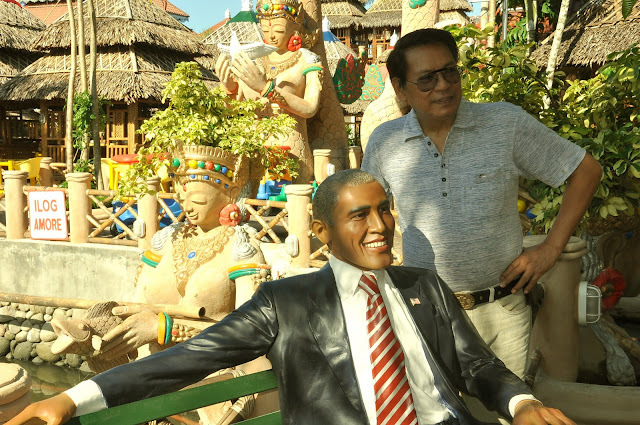 You know, Pareng Obama and I were enjoying the performance of the Singing Cooks and Waitresses. Jegs and I had lunch in the place the other day. Not a bad place to dine, though. Travelers plying the this route would enjoy such a stop-over for an interesting lunch. I do have bad taste buds, and I’m not interested in all that’s served there. There those that I like, though. Well, that’s all I’ll say since I’m not a the drum beater for Isdaan. Changing Times or Changing Mores?